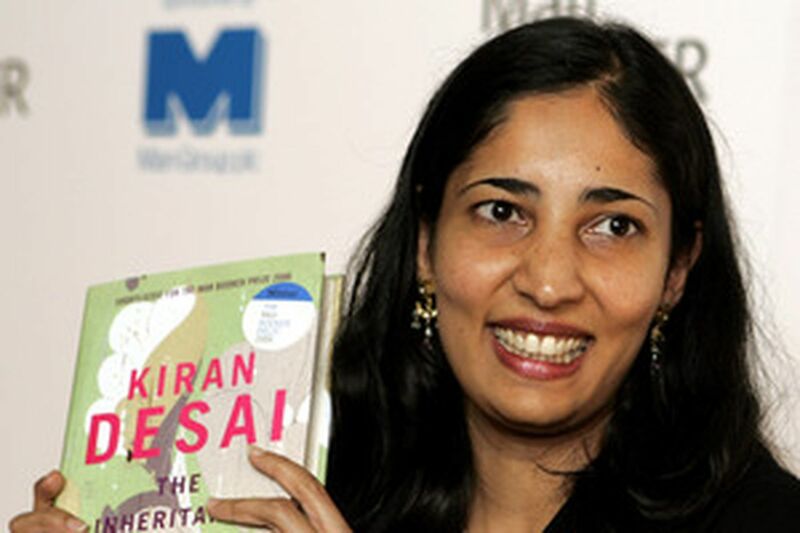 Kiran Desai accepting the British Man Booker prize for her novel in 2006. Her tour brings her to Philadelphia tonight. BROOKLYN, N.Y. - If it's Tuesday and you're Kiran Desai, it must be Seattle or L.A. or Berlin or Hong Kong - another signing or reading somewhere. That is, it's like many a Monday and Wednesday and Saturday in the year 1 A.B. (After Booker), the afterlife since Desai became the youngest woman ever to win Britain's top fiction prize. The triumph came last October for her second novel, The Inheritance of Loss, a finely textured story that mixes post-Raj dilemmas of modern India with the challenges of Indian immigrant life in New York. On this sunny near-spring day, Desai's due by evening in Washington. At the moment, just an hour before her driver arrives for another race to the airport, she's a hop from her apartment in Park Slope, enjoying baked eggs, fontina and prosciutto in the dark wooden comfort of Bar Toto, a favorite Italian cafe from which green-brick roads extend in all directions. "I feel that I'm living a cartoon life," says the accomplished 35-year-old Indian American writer, who recently added the National Book Critics Circle Award to her cache of accolades for Inheritance. She means the almost nonstop national and international traveling she's been doing for the book. "Because it's one day in every place. A cartoon version of Hong Kong, a cartoon version of Shanghai. . . . It's very frustrating." Having spent close to eight years in semi-isolation writing Inheritance, Desai, as almost every profile of her points out, is not a barnstormer by nature, but she's game. "Nothing happened for years," she says, with slight deadpan smile, about her career. But it's not all fun. Don't feel disconcerted at the Free Library tonight - yes, it's our turn for a visit - if Desai stares hard at your blouse, jacket or scarf. The last time she took Amtrak from Manhattan to Washington for a promotional trip, someone stole her travel bag when the train stopped in Philadelphia. No wonder she prefers the shuttle. "Maybe I'll see my clothes again in Philadelphia," Desai says with an expectant giggle. "Maybe I'll see them on the street." Behind all the to-ing and fro-ing, of course, lies the seriousness of the book. Daughter of the great novelist Anita Desai, herself a three-time Booker nominee, Kiran Desai grew up in India till the age of 14, moved to New England when her mother began a teaching job at MIT, and began to write fiction as an undergraduate at Bennington. Moving on to graduate studies at Hollins and Columbia, Desai made writing more or less her life. Her first novel, Hullabaloo in the Guava Orchard (1998), the comic tale of a government worker who takes up residence in a guava tree and becomes celebrated as a holy man, drew delighted, enthusiastic reviews. Inheritance, a book that reflects multiple aspects of her family history, then became her great, almost decade-long project, a manuscript that swelled to more than 1,500 pages before Desai, with help from Mom ("I'm just more tolerant of a messy, raw book," says Kiran), winnowed it down. Like most Indian and Indian American writers today, she's aware that "it's the best time to be an Indian writer, there is this huge appetite." But she cautions that most of the writing is "coming out of one particular class," affluent Westernized speakers of English. Indian literary observers recognize that as a problem. Desai says her authorial situation, like that of Indian American peers, is fraught with complexity, a truth she found reconfirmed on a recent book tour of India. "You're claimed as an Indian author if you live abroad," she explains, but that immediately makes one subject to all sorts of pointed questions, such as, "Are you presenting India in a fake version, exotic version, selling it to a West that is hungry for that naive picture of India?" An odd upshot for Desai in India, given that Inheritance largely exudes compassionate solidarity toward underclasses exploited both in India and America, was a hostile reaction to the book by some Indian Nepalese readers in Kalimpong. That's the northeastern Himalayan town of 60,000 people where Desai attended convent school. Desai sets a major part of Inheritance there, the story of the orphaned teenage girl Sai, her grandfather - an old Cambridge-educated judge named Jemubhai Patel who's still embittered by British treatment of him - and Sai's Indian Nepalese tutor Gyan, a poor boy with whom she falls in love before his commitments to a separatist movement eclipse the relationship. "My aunt was forced really in a way to disown me," Desai laughs, before turning somber. "It really, really surprised me," she says. "Your desire as an author is to talk about one or two people . . . you're not attempting to present a movement or a people or a flag." She notes that even though she felt "sympathy" for the Gorkha movement that sought independence from India, she admits she did not "portray the movement in a heroic light," which angered some of its sympathizers. Ultimately, Inheritance is about both characters such as Sai and Biju, the son of the judge's cook who faces the miseries of a marginal immigrant in Manhattan, and big themes such as class conflict in India and America, the injustices of globalization, and "how shaky reality really is, how many possibilities there are for telling stories and seeing things differently." "It's hard to know how best to write about immigration," Desai concedes. "I think the judge is a good example . . . he's so conscious of his pride and dignity, it becomes such an important thing, that he loses his humanity." Asked what she thinks about The Namesake, the Mira Nair film of Jhumpa Lahiri's novel about Indian immigrants that's now playing around the country, Desai, who knows both Nair and Lahiri, demurs. You get the feeling that she's not on the same page with that story's upbeat, Horatio Alger depiction of immigration as a generation-by-generation, up-by-the bootstraps tale of ascent toward a happy ending. To Desai's eye, it appears, such a vision misses the anger, the harshness, the brutal vocabulary in which such lives are often led. "I think when a lot of Indian immigrants write," Desai says, ready to hit the road again, "they make the story much less scary than it is. . . . I know if I write an arranged-marriage book, it will be a huge grabbed-up book. Everybody will be so happy."